Discussion in 'Newsfeed Zone' started by NewsBot, Feb 9, 2019. Meet Notre Dame WR Miles Boykin. 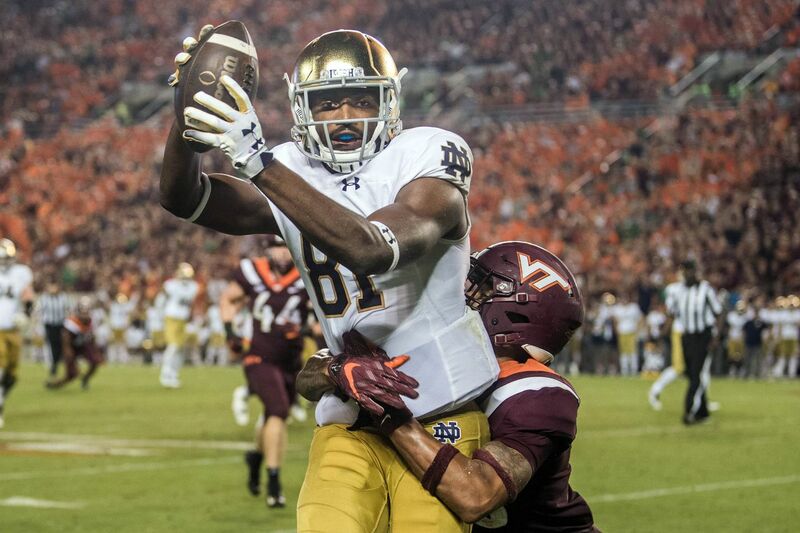 It took Miles Boykin until his senior to make his mark on the Notre Dame football team, but it came at the perfect time for the 6’4”, 225-lb wideout. Coming out of high school, Boykin was rated the 151st player in nation and 16th wide receiver by Rivals.com. Deciding to stay close to home, and loving what he saw both from the football program and the academic side of things, Boykin decided to take his talents to Notre Dame to join the Fighting Irish football program in 2015. Miles Boykin plays with tremendous size and physicality when attacking the ball in the air. He is able to use his height and arm length to go up and get the football with ease. Due to his physicality and play strength, Boykin is able to stay physical throughout the stem of his route, and stay on track without getting knocked off balance. At the catch point, he plays with tremendous body control and is able to adjust to the ball in the air extremely well for a man of his size. Catching the football comes easy as he possesses some of the most reliable hands in this draft class. Boykin has very large, strong hands, and is able to pluck the ball out of the air up-and-away from his frame. He was a very versatile player at Notre Dame, playing both in the slot and lined up outside. While making his presence known between the 20’s, Boykin was very effective in the red zone in 2018 going 9/15, with five touchdowns (stat from Ben Fennell, NFL Network). Boykin is a very physical player when it comes to blocking in the screen and running game. The NFL combine will be huge for Boykin. On tape, he lacked the ideal long speed to separate from defensive backs down the field consistently, which led to far more contested catch situations than you’d like to see. Boykin also played very tight in his hips and legs, and struggled sinking when working routes back to the quarterback. There were far too many instances where he gave the DB time to recover due to the inability to sink and explode out of his break. He ran a pretty limited route tree at Notre Dame, so developing as a route runner will be something Boykin must show at the combine and at his pro day on March 20th. The best football from Miles Boykin is likely yet to come. With his physical traits, reliable hands, attitude, and work ethic, Boykin could make a living in the NFL working both on the boundary and in the slot. When given a free release, he showcased enough speed and nuances in his route running to get open in a variety of ways. Coming into the league, he has two of the traits you can’t teach in the NFL — size and reliable hands. If the former Fighting Irish wideout can continue to develop both as a route runner and athletically, Miles Boykin is a name you could be hearing on Sunday’s in the future. Check out our interview with Miles Boykin on the BTB podcast - Talkin’ The Star.